There are many ways to define mindfulness. I define mindfulness very simply: Mindfulness is non-judgmental awareness . Let’s break that down a bit more. First, awareness …what does it mean to be fully aware? Awareness includes acknowledgment of both external and internal stimuli. We use our 5 senses to become aware of what is happening externally. What you see, what you hear, what you smell, what you taste, and what physical sensations you are having (ex: are you hot or cold). Second, awareness means having a focus on what is going on internally. What thoughts are going through your mind? What feelings are you having? How does your body feel from head to toe? Do you notice any tension or discomfort? Are you tired? If you really stop and think about it, there is a lot happening all the time both inside of us and all around us. The other part of my definition of mindfulness is non-judgmental . Meaning that as we focus our awareness on the internal and external stimuli, we do so in a non-judgmental way. I notice that there are clouds in the sky today. I do not wish the sky was sunny instead, I simply notice the clouds. I notice that there is a chill in the air. I do not wish it were warmer, I simply notice the chill. I notice that I am having worried thoughts about a big presentation at work tomorrow. I do not give myself a hard time for worrying, I simply notice the presence of that feeling and allow it to be there. It can be very difficult at times to view the stimuli around us in a non-judgmental way, but doing so helps us to detach from specific stimuli in order to be more fully present. Incorporating the practice of mindfulness meditation into one’s daily life has been shown to promote a sense of psychological well-being. Mindfulness helps us to feel more calm and peaceful as we navigate the chaos and busyness of the day. It makes it easier to savor the pleasures in daily life and gives us a greater capacity to manage adverse events when they arise. 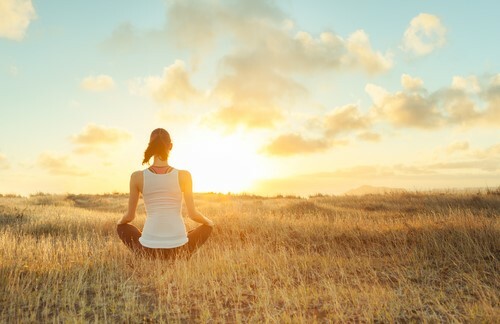 Mindfulness practices can also help to decease symptoms of depression and anxiety as well as other mental health issues such as PTSD, OCD, substance abuse, and marital issues. Mindfulness practices can even improve your health. It relieves stress, reduces chronic pain, can improve sleep, help lower blood pressure, and alleviate gastrointestinal difficulties. I think people often shy away from beginning a mindfulness meditation practice because they don’t know what to do or how to do it. I have so many people tell me that they just can’t meditate, it doesn’t work for them, they get too distracted, or they can’t find the time. I think people often associate meditation with an empty, calm mind, a state of bliss they will never achieve. An image of a monk sitting in a monastery comes to mind, and that is something that most people can’t relate to. The truth is that even those monks sitting peacefully in the monastery are having all kinds of thoughts pop into their heads, some pleasant, some not so pleasant. Yet, they continue to practice mindfulness by acknowledging their thoughts and feelings and allowing them to come and go like leaves floating down a stream. Mindfulness meditation does not need to be difficult. It can be achieved with just a few minutes a day, and it can be done anywhere, anytime. Even while you are going about your normal daily routine and chores. Here are some of my favorite ways to practice mindfulness meditation. And remember: the key to a successful mindfulness practice is…PRACTICE. The first time you try it, you might not feel successful. You might feel frustrated. It might feel weird or uncomfortable. That is true for any new endeavor. It takes practice to learn to cook, to learn to play a musical instrument. The same is true for mindfulness. The more you practice, the easier it gets and the more benefits you reap. This is my favorite exercise to do when I am trying to go to sleep. It is a great way to relax your whole body after a long, hard day. The idea is to consciously think about every part of your body, one by one, starting with your toes and working your way up to the top of your head. Bring your awareness to each part of your body and intentionally relax that part of your body. You can find many options for body scan meditations by doing a quick google search. Here is one of my favorite links to get you started. I first learned about Leaves on a Stream from Russ Harris’ book The Confidence Gap (which I recommend). It is a wonderful exercise to help you diffuse and detach from your thoughts and feelings. The idea is to visualize a stream flowing gently in front of you. Imagine that there are leaves floating on top of the water, gently following the current down the stream. As you sit and watch, those leaves will pass by and be replaced by other leaves. The same can be true of our thoughts. Simply imagine each thought as a leaf flowing down the stream coming into, and then moving away from our awareness, by no force other than the natural movement of the water. A mindful walk is one of my favorite ways to practice mindfulness. While it is lovely to go out on a nature trail and experience the beauty of our natural surroundings, that is not necessary to achieve a state of mindfulness. A simple 5 minute walk around the block right where you are is sufficient. Just make a conscious effort to notice everything around you in a non-judgmental way. Notice the trees, the grass, the flowers, the breeze, the sounds, the smells. Pay attention to all of the little details while allowing the thoughts that pop into your mind to bounce right back out. Just thoughtfully bring your attention back to your surroundings. If a walk around the block is not possible, my second favorite mindful activity is drinking a cup of tea (preferably decaffeinated). Savor every part of the experience. Watch how the steam billows from the cup when you first pour it. Feel the warmth of the cup in your hands. Smell the delicate aroma. Taste the tangy sweetness. Involve all of your senses and let everything else slip away except the experience of that cup of tea for as long as it lasts. I hope that you are getting the drift that practicing mindfulness can be a 5-10 minute long process that you can fit easily into your day. It does not need to be a long planned for activity requiring space, solitude, or silence. By making it fit into your regular daily routine, you are much more likely to make it happen.